MULTIHULL CRUISING - WHAT IT'S LIKE TO SAIL DOWNWIND IN A MULTIHULL. TRADE WIND SAILING WITH CAPTAIN DAVE AND EXIT ONLY. Multihulls are superb yachts for sailing downwind around the world. 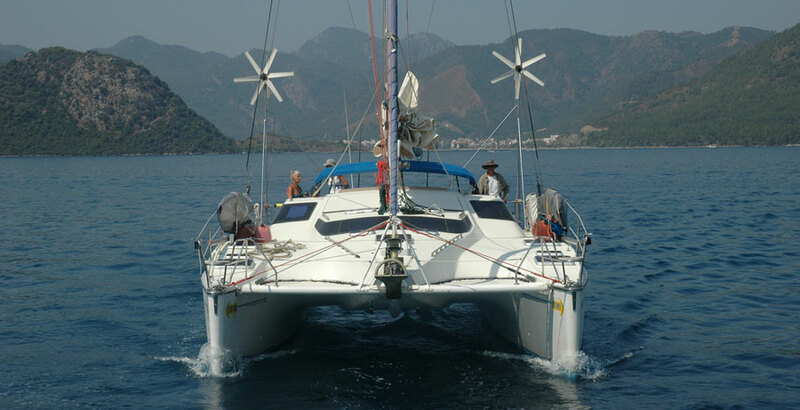 They are an extremely stable sailing platform that does not roll as the yacht sails directly downwind. The big question is, "What is the best sail rig for downwind sailing?" Cruising multihulls making offshore passages haven't been around that long, and many people carry their monohull biases into the multihull world. The fact is, multihull performance and behavior are so different from monohulls that you need to have a new and different way of thinking about how you sail a multihull offshore. A good example of this is downwind sailing. When I first started sailing downwind around the world, I absolutely drove myself crazy trying to run downwind wing and wing. My monohull brain said that I should vang the main out on one side of the yacht and the headsail out on the other side of the yacht, and life would be perfect as I sailed downwind to paradise. Unfortunately, things didn't work that way on the high seas. There were several reasons. 1. We didn't have backstays like a monohull. Instead, we had cap shrouds that came back about 2/3 of the way aft. That meant that I could not get the mainsail as far forward and as flat as I wanted to sail downwind. The capshrouds were in the way. 2. I had diamond stays on the mast to hold the mast in column. When I tried to sail wing and wing, the mainsail would chafe on the spreaders that had a backward bias in their positioning. I didn't like that chafe. 3. The mainsail on a catamaran is extremely large with an equally large roach, so in the wing and wing configuration, the main tried to overpower the headsail, and we tended to round up into the wind. Someone had to be watching things like a hawk to keep everything in balance. If you reefed the mainsail so that it had less power, and the headsail overpowered the yacht, then you could have an unintentional gybe. 4. Because of the tendency to round up created by the battle between the mainsail and headsail, you had to pay attention to sail balance all the time. If the mainsail overpowered the boat and we rounded up into the wind, then the Autohelm 7000 joined into the fray and tried to bring the boat back on course. If the autopilot made a maximal correction and the boat didn't get back on course, the autopilot tried even harder to do it's job until it stripped out the epicyclic gear on the autopilot. So if we did the wing and wing sail combination, someone had to sit in the cockpit and watch the autopilot, the sails, and the seas to make sure everything stayed under control, and the autopilot didn't destroy itself. We only stripped the epicyclic gears one time during our circumnavigation, but we learned our lesson. Don't put the autopilot in a position where it is at a massive disadvantage, and you will keep a smile on the face of the autopilot. We left Fort Lauderdale on our circumnavigation with our monohull brains forcing us into the wing and wing sail pattern. By the time we arrived in Panama, we realized that we needed to have something that worked better downwind. We figured out that we needed (horror of horrors) two spinnaker poles and a double headsail rig. Once we put out two spinnaker poles and double headsails, and doused the main, our life instantly improved. Words like "awesome", "unbelievable", and "it doesn't get any better than this", popped into our minds. Click on this button to tell your friends about "Double Headsail Downwind Sailing". Sailing downwind with a double headsail rig was a dream come true. Nobody needed to watch the mainsail. There were no chafe problems with the mainsail rubbing against rigging and spreaders. The autopilot was supremely happy because the center of effort was at the bow of the boat, and the autopilot no longer had to battle the mainsail. There was a permanent smile on our autopilot's face as we sailed downwind around the world. 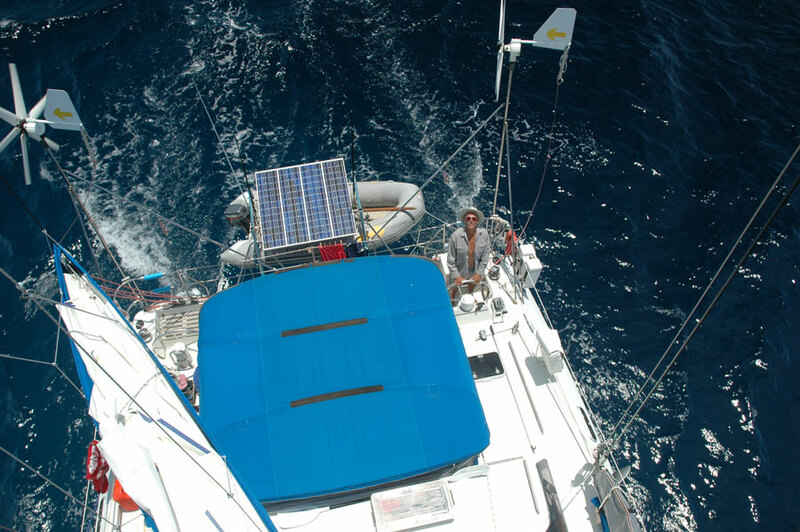 When we started our circumnavigation, we decided that we wanted to do it the easy way. We would sail around the world in the trade winds. Of course, it's impossible to go all the way around the world in the trades, but for the majority of the long passages, it's possible to sail in the trades. Five-hundred years ago, sailors knew that the trade winds were their friends. Whenever possible, they headed for the trades to get the horsepower they needed for their global adventures. Although ocean voyaging has changed a lot since the days of the square-riggers, trade wind sailing remains unchanged. When we wish sailors well, we still say, "Fair winds and following seas." That means only one thing - winds and seas abaft the beam. Catamarans are excellent trade wind yachts. They can sail directly downwind without the rolling that plagues monohull yachts. Catamarans travel like they are on railroad tracks when sailed like a square-rigger downwind. The fore and aft rig is a problem when running directly downwind. When you run wing and wing, the mainsail and genoa continually battle for supremacy. If the mainsail wins, the boat rounds up into the wind, and if the headsail wins, you sometimes experience an unwanted, uncontrolled jibe. It's hard to balance the mainsail and genoa in the wing and wing configuration. The crew continually has to stay on top of the sail balance and make helm adjustments to keep things under control. The battle between the genoa and mainsail isn't so bad if you don't mind standing eternally at the helm staring at the sails. You can sail wing and wing forever if you have a large, competent crew. But if you want to use the autopilot, the wing and wing configuration can cause problems. Out of balance sails can overwhelm the autopilot, and if you are unlucky, the autopilot will strip its gears while attempting to get the boat back on course. When I sail offshore, my first priority is to keep my crew out of harm's way, and my second priority is to protect the autopilot. Our autopilot steered Exit Only 99% of the way around the world, and I hold our autopilot in high regard. On only one occasion on our circumnavigation, our autopilot was overwhelmed by a full mainsail in following seas, and the autopilot made a valiant attempt at correcting our course, and instead succeeded in stripping its epicyclic gears. When the autopilot attempts to make a course correction without success, it doesn't stop trying. It just keeps putting pressure on the gears, and finally the motor overwhelms the gears and strips them. I stay away from the wing and wing configuration on Exit Only because I want to protect my autopilot. 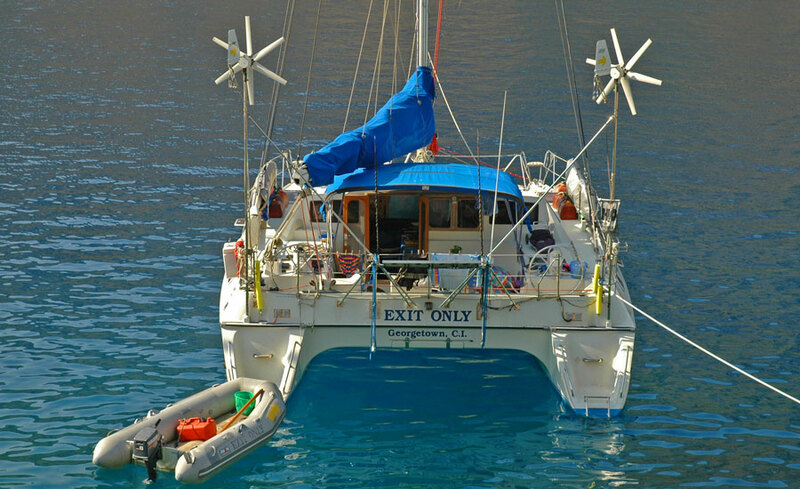 I also stay away from it because a double headsail rig works much better on a catamaran. When I sail downwind in the trade winds, I don't use my mainsail. Instead, I sail using two genoas held out by two eighteen foot spinnaker poles. One of the genoas is attached to the roller-furler, and the other is flown with a free-standing luff. This double-headsail rig moves the center of effort of the sails all the way forward to the bow, Exit Only glides smoothly over the waves, and the autopilot has a smile on its face. 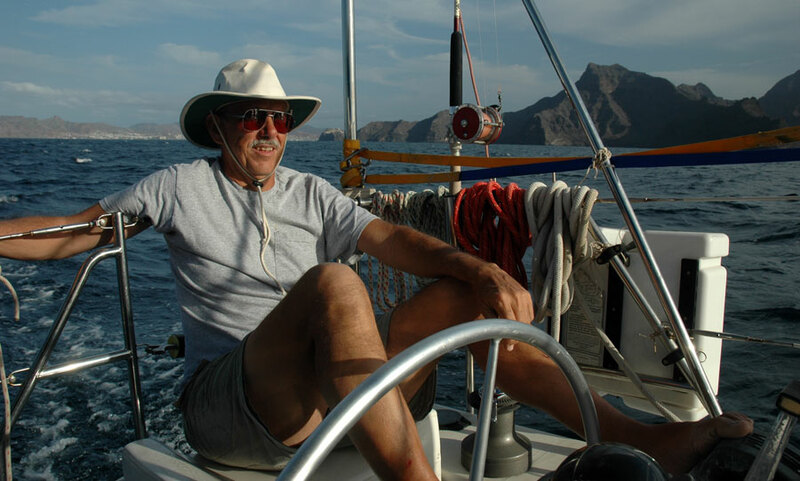 With the double-headsail downwind rig, lee helm and weather helm aren't a problem. The helm remains neutral, and the autopilot easily makes small course corrections as we sail downwind. 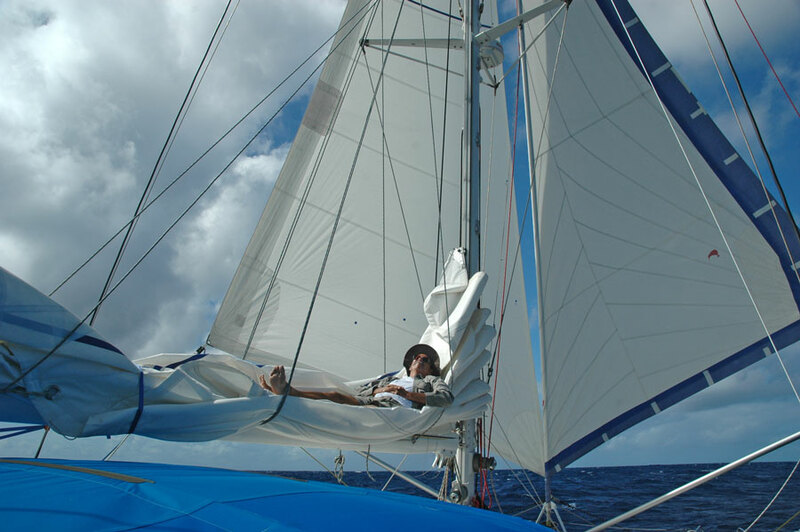 The double headsail rig is so stable, and the helm is so balanced that I can recline in the comfort our mainsail while the autopilot holds us on course as I live my trade wind dreams.. 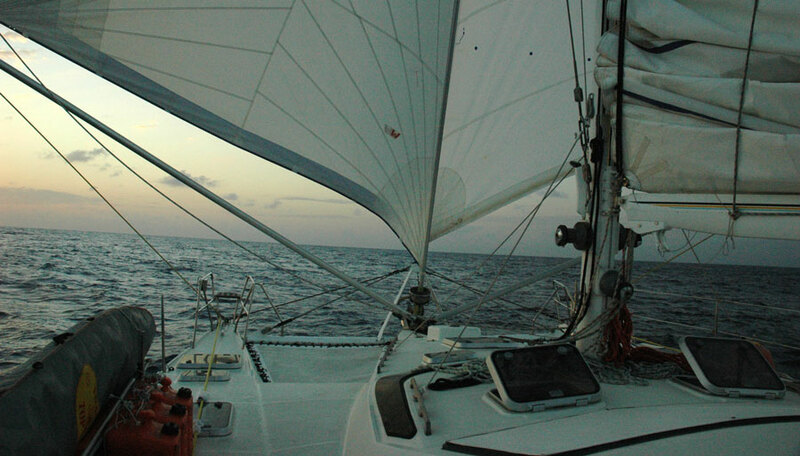 When we sailed across the Atlantic, we used our double-headsail rig all the way to Barbados. The rig is easy to set up and take down. Before we leave port, we fix our spinnaker poles in position using a topping life, a foreguy and an afterguy. We leave those poles up all the way across the Atlantic. The poles serve a triple purpose. First, they keep the sails out in front of Exit Only at the level of the bows. Second, they keep the headsails quiet. Third, they allow us to carry the double headsail rig until the wind moves forward almost to the beam. Keeping the sails out in front of the bows keeps the center of effort of the sails forward and balanced which makes it easy for the autopilot to steer downwind. Keeping the sails quiet is a big help to the person on watch. He doesn't need to continually look at a thousand square feet of white sail in front of his eyes to tell what's happening. He only needs to listen with his ears. If the sails are starting to flutter, the wind has moved forward, and it's time to adjust the course. If the sails are quiet, it's time to keep on trucking. The poles make it possible for the wind to move around a great deal without having to make major course adjustments. You don't need to be sailing directly downwind for the rig to work. As long as the wind stays twenty degrees abaft the beam, you can carry the downwind rig. We have one headsail on a Profurl roller-furler, and the second identical headsail flies with a free standing luff. We roll the Profurl headsail in and out according to how hard the trades are blowing. The Profurl sail is like a throttle that we adjust to control our speed and the amount of stress on our rigging. If the wind becomes too strong and we want to take down the free-standing genoa, we unroll the Profurl on the same side of the boat as the free standing genoa to blanket it. Then we can easily take down the genoa without having to battle a flogging sail. It would be easier to have two Profurl roller furling headsails, but that would cost a lot more money and require modifications to the mast and rigging. So we do it the less expensive way which is a little more work. If the trade winds blow really hard, we use only one headsail; we roll the Profurl in and out to suit the prevailing conditions. It's more fun to go sailing when you do no bruising cruising. It's more fun to sail downwind when you have a balanced helm. It's more fun to cross oceans when the autopilot steers the boat. That's why we sail in a catamaran and use a double-headsail downwind rig. In the grand scheme of things, my grand schemes seem fairly insignificant. In a global sense it's easy to feel as if my life counts for nothing, or at most, counts for little. I've had several earnest people tell me in no uncertain terms that I was wasting my life as I sailed around the world on my yacht, and I can understand why they felt that way. Those people thought I was on a prolonged vacation, and they didn't understand that I was making a life and doing things that were important to me. They couldn't see that I was giving my children a multicultural experience that made them into citizens of the world. We didn't just sail around the world, WE SAILED AROUND THE WORLD AS A FAMILY . In the age of single parent families we were doing things the old fashioned way - we were a real deal family unit in which every person on board had responsibilities that contributed to a safe voyage. My children survived without cell phones and a dreaded peer group to complicate their lives, and they grew up to be good citizens of the world who actually cared about other people - even people from the third world. During that eleven year voyage, I maintained the yacht, wrote five books, started three web sites, and paid for my children's college education. There weren't enough hours in a day to do all the important things that demanded my attention. 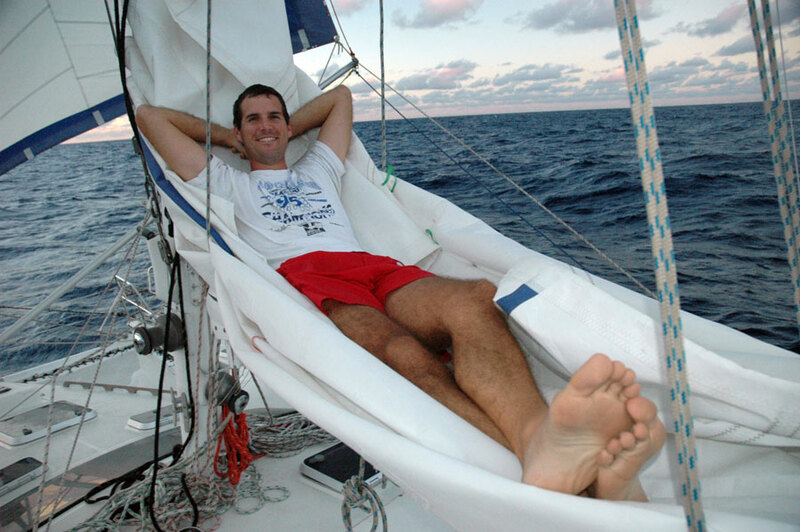 Now that I have sailed around the world, I can finally take a real vacation from all of that work. A long time ago I learned that what other people think of me is none of my business, and I focused on doing what was important to me. Life is an inside job that works best when I start from the inside and work my way out. When someone tells me that I shouldn't be doing things that are important to me, and that I'm wasting my life, they are really saying that my dreams don't count in their scheme of things. My dreams aren't important, and instead, I should live dreams that make sense to them. These people are Outside-Inners because they are taking their outside dreams and trying to cram them down my throat, and that doesn't work. It's the recipe for anger and frustration, and is a terrible way to make a life. In the grand scheme of things, my grand schemes are supremely important to me and to me alone. I have a choice. I can either live my dreams, not worrying about what other people think, or I can forget my dreams, and let them wither. If I do that, my spirit will wither as well. Joy will no longer spring up in my heart, and each step I take will echo the dull thud of dread I feel in my heart that results from not living my dreams. The handwriting is on the wall, and the message is clear. There is simply nothing more important than living my dreams. Even if I don't rock the world, I can still rock my world and that's what counts. Someone much smarter than me said, "What you do isn't important, but it's important that you do it." Those words have the ring of truth, and you can build your life on them. So fire up your dream machine and have a few grand schemes of your own, because that's why you're here on planet earth. God gave you the capacity to dream, and He gave you a lifetime to make those dreams come true. Please excuse me. I must go now because it's time to work on my grand schemes. Click on this button to tell your friends about Grand Schemes And Other Important Things. RIGGING EMERGENCY AVERTED: YOUR SAILBOAT IS TALKING TO YOU, BUT ARE YOU LISTENING? David and I are sitting on the lower spreaders of Exit Only, and we are taking care of business. Although we survived the trip up the Red Sea during the previous two months, we took quite a beating in the Gulf of Suez. 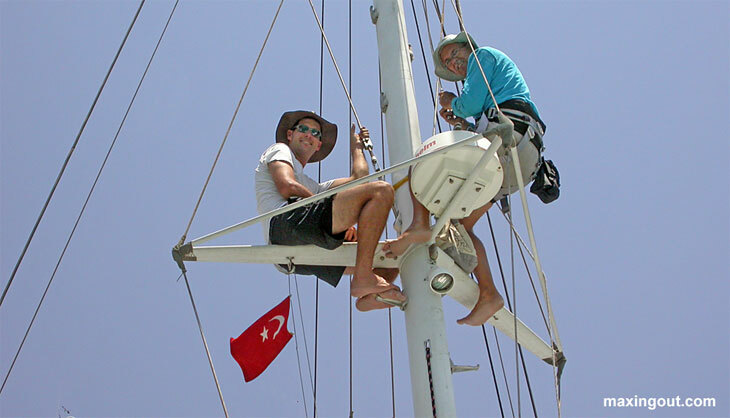 We didn't know how much of a beating it was until we hauled out in Turkey and checked the rigging. What we found was scary. A stainless steel strap toggle holding the headstay in place had apparently broken during the Red Sea transit. 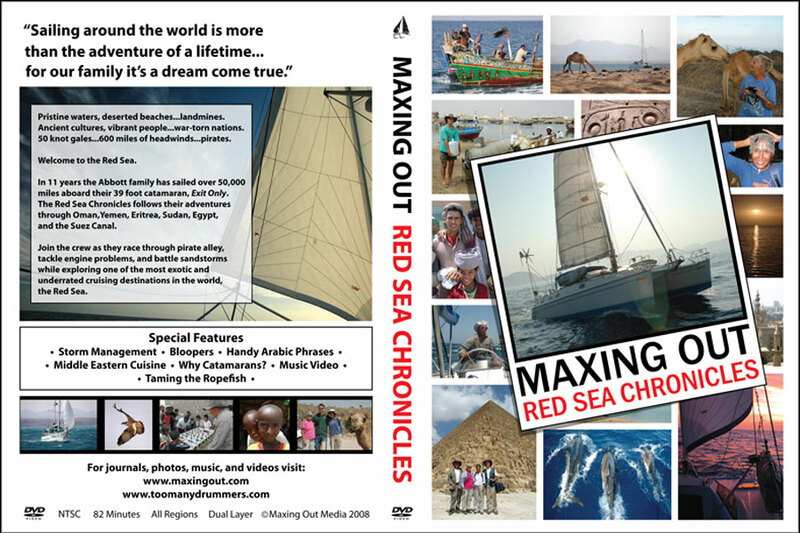 We were extremely fortunate that we didn't loose our mast as we slogged up the Red Sea. A Turkish craftsman fashioned a new strap toggle out of stainless steel, and we installed it to prevent the mast from going over the side at sea. We truly snatched victory from the jaws of disaster. After discovering the failure in the headstay strap toggle, we decided to climb the mast and inspect all of the rigging. The inspection found broken strands of wire in an eight millimeter diamond shroud. Rigging problems seemed to be coming down like rain, but at least we weren't off shore when it happened. I wasn't too upset, because it's always better to deal with rigging problems while I'm in safe harbor than when I'm in forty knots of wind offshore and could easily lose the mast. Losing a mast is expensive. Without insurance, such a disaster could cost upwards of twenty thousand dollars if you do all the work yourself. If you hired it done with labor rates at seventy-five dollars an hour, your cruising kitty would instantly implode. If I lose my mast, I lose the ten thousand dollar deductible on my yacht insurance. That's a huge chunk of cash to lay out for a problem that's probably preventable. Before I sail offshore, I always climb to the top of the mast and check every piece of rigging to make sure there's no problem. It's a hassle to put on a climbing harness and do a tap dance up the mast, but it's not nearly as unpleasant as dealing with a dismasting at sea. In my time aloft I've identified broken strands of stainless steel wire on at least ten occasions, and the few minutes spent climbing the mast have paid off in a big way. Sailboats are always talking to you. Sometimes they whisper, and other times they shout. When you go aloft and find a tiny fractured strand of rigging wire, your yachts is whispering a warning. "Fix me while it's cheap and easy." If you wait until your yacht shouts at you, it's going to be screaming things you don't want to hear. You'll be hearing words like, "You really messed up this time. Why didn't you check my rigging before you sailed offshore. Now my mast is in water and it's going to cost you a ton of money. How could something like this happen when you call yourself a mariner?" We have sailed over thirty-three thousand miles around the world, and during our voyage we replaced damaged rigging in Bora Bora, Fiji, New Zealand, Australia, Turkey, and Gibraltar. In each instance, we discovered a problem and dealt with it before it became an emergency. That's the way mariners get their yacht around the world. Eternal vigilance is our best friend and beats good luck seven days of the week. There's an old saying, "The harder I work, the luckier I get." I would recommend that every mariner carve those words into their main bulkhead, get them tattooed on their forearm, and have their wife repeat them at least seven times a day. If you want to sail around the world, you must work hard to push the odds in your favor. Good luck isn't going to keep your mast upright where it belongs. You're the only one who can make that happen. You earn the right to sail on the ocean of your dreams by taking good care of your yacht. When you take care of it, it takes care of you. DON'T HESITATE! TAKE THE PLUNGE NOW AND ORDER THE RED SEA CHRONICLES. JUMP INTO A GREAT MULTIHULL CRUISING DVD. YOU WILL BE GLAD THAT YOU DID!